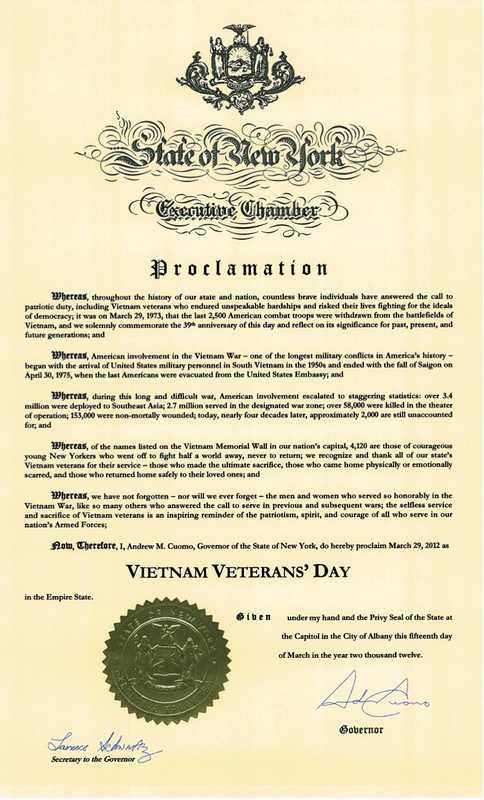 Governor Andrew M. Cuomo, of the State of New York has decreed March 29, 2012 as Vietnam Veterans Day with this official proclamation. A tribute to so many who served, either through draft or enlistment, at the Nations request to defend freedom in a world many have never even heard of. A tribute to the price we pay to live in a free world. The distance that time places between us and the memory of a wounded Nation is all the more reason to proclaim the sacrifice of the few for the many. “Whereas, we have not forgotten – nor will we ever forget” as quoted from the proclamation, are words we hope will remain with all of you. To those have served, are serving, and will serve, this Nation says Thank You. With gratitude and appreciation for all they do, we thank the men and women who operate The Wall, a website “dedicated to honoring those who died in the Vietnam War.” Through this site, we can remember the cost of war as paid by those from New Rochelle. May they not be forgotten.